Click here for shareable profiles of each honoree, plus statistical information from this year's list, and more. Also, to buy tickets to this year's 40 Under 40 Awards Dinner, click here. In 2011, Cohn & Wolfe hired Kerri Allen from Revolución to ramp up its Hispanic offering. Allen went bigger: She built an entirely new cross-cultural practice, Infuse, turning it into a multimillion-dollar division and adding seven multilingual, multicultural PR professionals to the staff. Allen’s passion for inclusion extended to her colleagues at C&W as she taught general market practitioners to confidently interact with media outlets such as Univision and The Root, and encouraged them to embrace a cross-cultural mindset. Infuse staffers are scattered throughout the office so everyone benefits from exposure to other languages and styles. "Kerri is an exuberant force within the agency, inspiring fresh perspectives among her colleagues and clients," says Liz Beck, EVP, and US consumer practice leader at Cohn & Wolfe. "She reinvented the traditional model to ensure our approach to cross-cultural marketing would be differentiating and meaningful." Allen has helped the firm land major multicultural accounts from brands such as Coca-Cola and United Airlines, and turned up multicultural opportunities at other existing clients. Shanté Bacon’s communications and experiential marketing firm, 135th Street Agency, has racked up a number of high-profile entertainment clients in the decade since its launch. Known for connecting and engaging with diverse audiences, Bacon’s firm has worked on nearly a dozen top-grossing films, such as The Avengers. The agency has also represented VH1, OWN, BET, and WE TV. Top non-entertainment clients include The New York Times and the US Postal Service. Bacon works to break down color lines in Hollywood, positioning 135th Street as a power player. "In an industry that lacks ethnic diversity, it is difficult for minority-owned agencies to compete for big-budget film and television projects," explains Saptosa Foster, 135th Street’s managing partner. "Shanté’s goal is to position the company among the PR power players in entertainment that drive the industry forward." Bacon is a member of New York Women in Communications, the National Association for Multi-Ethnicity in Communications, and Women in Entertainment Empowerment Network, a group that works to promote positive images of women in show business. She also gives back by mentoring youth to inspire the next generation of entrepreneurs. Deisha Barnett oversees the frontlines of Walmart’s national media strategy, picking up the phone in a recall or other merchandise crises and guiding and responding to journalists. She directs the comms strategy around the biggest shopping events of the year, including back to school and Black Friday, when millions flood through the retailer’s doors. Barnett also rolled out PR-specific modeling-mix research that examines consumer exposure to messages and their intent to purchase. Leading a team of seven and managing several agency partners, Barnett wouldn’t seem to have time for much else. Yet, Walmart’s top executives turn to her for strategic counsel on issues impacting the customer and the company’s reputation. Recognized internally as a leader, Barnett was named to the CEO’s mentoring circle in 2010, as a "Walmart corporate affairs key leader." "Deisha has led and grown a communications team that pushes our business forward by sharing innovative offerings with our millions of customers in new and compelling ways," says Dan Bartlett, EVP, corporate affairs at Walmart. Barnett is a guest lecturer at her alma mater, Clark Atlanta University, and is active in both the Black Public Relations Society of America and the Public Relations Society of America. When it comes to communications specialties, Stacey Bernstein might have carved out the smartest one yet: digital health. Four years ago, Bernstein developed a digital health solution for one of her clients that evolved into the creation of Weber Shandwick’s digital health practice. Now it comprises 25 digital health specialists working global campaigns for more than a dozen large clients. Merging digital and social and the complicated regulatory environment of the pharmaceutical world, Bernstein counsels clients on this convergence, helping them to develop best practices, strategies, and tactics that resonate. "Stacey and the Weber team really get the power of digital to transform and influence," says Jeordan Legon, head of digital and social media for Novartis. "With her help, we’ve been able to ramp up the use of social media, reaching more of our key audiences and showing our leadership what’s possible in this space." Recognized as an industry expert in her field, Bernstein’s skills are sought-after internally and externally. She manages Weber’s global digital health training program across its 126 offices and speaks at industry events including South by Southwest, Cannes Lions Health Festival, and the Hong Kong Association of the Pharmaceutical Industry. Brooke Blashill works across the lifestyle, fashion, technology, and sustainability sectors as an SVP at Ogilvy Public Relations, advising top-tier brands such as Shell, Ford, and Tiffany & Co. Praised by colleagues for "exceeding ROI and business objectives," Blashill is also recognized for creative, but carefully executed campaigns. "Throughout her career, Brooke has demonstrated leadership, creativity, and innovation in her field," says one peer. When Ford celebrated the Mustang’s 50th anniversary, which included the launch of a clothing line, Blashill led the company to its highest conversation spike and 100,000 new Facebook fans in five days. She also created the Shell Fuel Save Challenge, a multi-year global campaign to inspire and educate consumers to save fuel and help position the company as an innovative consumer brand. A member of the Luxury Lifestyle Professionals Group and Fashion Marketing Group, Blashill lives and breathes fashion. She often lends pro bono PR support to young fashion designers, particularly those creating sustainable products made in the US. As the crisis and issues management practice lead for Edelman in the Southeast, Conroy Boxhill has smoothly managed major crises, a Graco car seat recall, and a potentially explosive Atlanta Hawks racial controversy. Boxhill has worked at Edelman for a decade; he joined as a young SAE working in the public affairs practice in New York. He was a key member of the team handling communications for the Lower Manhattan recovery effort, an award-winning campaign. His team also worked on the spinoff of ITT into three independent companies. "Conroy is a strategic communicator who has the ability to quickly synthesize a situation and develop an approach that is customized and effective," says Nzinga Shaw, chief diversity and inclusion officer at the Atlanta Hawks and a former Edelman executive. In Atlanta, Boxhill has doubled the practice’s revenue and added signature names to the portfolio, including baby products brand Gerber, VF Corp., and Georgia-Pacific. The agency has awarded him three of its most coveted internal awards: an Eddy for individual excellence and another for team innovation; and the Charles E. Fremes award, given to the employee who most completely demonstrates the organization’s values and spirit. Adrienne Cadena was just 24 when she took over Formula’s struggling experiential marketing division in 2009. Havas Street, which is owned by Formula’s parent company Havas, is now a $3 million enterprise that jumped from a single client to 10, including brands Heineken USA and Dunkin’ Donuts. In the last year, Havas Street – which offers clients services such as guerilla street teams, sampling programs, mobile marketing tours, and publicity stunts and events – added Fox Hispanic Media, Belgian beer Affligem, and snack company Popcorn Indiana to its roster. The Heineken account was expanded to include all of its US samplings, with Cadena responsible for its largest yet: a 10-month blitz of 30,000 events across the brewer’s portfolio of brands. Cadena innovates with her clients and agency in mind, demonstrating a deep understanding of the business. She helped develop an online reporting system for tracking and real-time program measurement of clients’ sampling programs. The customized dashboard lets team members seamlessly provide on-site event reports, recaps, reconciliation reports, and a program-end analysis to all clients. "Clients are thrilled with this ability to show proof of their return on investment," say colleagues. Kristina Chang is as comfortable working on a consumer product launch as she is explaining health economic research to jaded journalists. She’s revered by clients and co-workers alike for an indefatigable approach to PR, always looking for a smarter, better way. "She’s creative, strategic, talented, and energetic," says her boss, Bill Foster, a business unit communications leader at Janssen, a pharma company subsidiary of Johnson & Johnson. "She always gives you her best thinking and brings forward her own perspective, even when it’s quite different, which raises all of us to another level." Chang built brand loyalty through her tireless attention to reputation management for more than a dozen of J&J’s iconic consumer brands after joining in 2007, including Listerine, Tylenol, and Band-Aid. When she transitioned to the pharma group, Chang brought subtle, but effective change to its direct-to-consumer and scientific and regulatory communications strategies. A high-profile, celebrity-studded integrated campaign for oral anticoagulant Xarelto, "achieved 12% consumer awareness of the spokesman’s brand association before the launch of the TV ad," and inspired more than 12,000 people to engage with a branded website. Vijay Chattha jumped into the startup industry, founding his San Francisco-headquartered VSC PR firm when he realized these upstarts were hungry for a different type of communications partner. Chattha quickly turned VSC into a top boutique player in the tech industry, representing equity positions in a number of mobile companies – including AdMob and Navdy – that successfully exited for a total of over $1 billion. VSC is also active on the VC side, counting Sequoia Capital and the Social+Capital Partnership among clients. "While many other PR stars have focused their careers on one rocket ship IPO, Chattha is the ‘turtle of Silicon Valley,’ steadily amassing a dozen major hits that have experienced over $8 billion in client exits and transactions in the past decade," says Enzo Njoo, brand synergist at VSC. Pairing comms advisement with investment, Chattha represents a new kind of PR pro, one with a real stake in the companies he advises. He continues to build new specialties alongside the ever-evolving tech sector, including Wareness.io, a marketing studio for hardware startups, and the hot wearables segment. VSC also offers select clients access to a $6 million seed investment fund, which appreciated more than tenfold in less than a year. Patricia Condon’s stock is sky high at Virgin America where she leads events and PR, from concept to execution. When the airline enters a new market, it kicks off multiple media events from takeoff to in-flight media to a red-carpet rollout that evening, and it all must be seamless for the high-profile company. Condon executes these and other events with an unmatched flair and professionalism, effortlessly managing across company departments from marketing communications to airline operations teams, external teams, partners, and of course, media. Her proficiency owes in part to her history with the brand. As an account director at Ogilvy Public Relations in 2007, Condon aided the launch of Virgin America’s inaugural flight. Two years later, she had moved in-house at the carrier and was overseeing its Boston launch. "Patricia is one of the best PR professionals I have ever worked with," says Abby Lunardini, VP of brand marketing and comms for Virgin. "She has demonstrated creativity, media relations savvy, and an attention to detail that is unmatched and in an environment that moves so quickly with business needs changing all the time. Having both that passion and focus is rare." Throughout an 18-year career, Nicole Dye-Anderson has successfully orchestrated campaigns and other efforts for a number of well-known brands, including Volkswagen, Verizon Wireless, and Colgate-Palmolive. She spent about eight years on the agency side before joining Barclaycard in 2012. At the credit card company, Dye-Anderson is the external comms leader, defining all PR programming and influencer engagement. Her impact on awareness and ultimately new customers for its portfolio of more than 40 credit card products has been profound. She "surpassed expectations by setting new records for our digital media campaigns" says CMO Peggy Maher. Her execution of a national launch around a new travel rewards card drove a 75% increase in approved card applications and 100 million media impressions, including WSJ.com and CNN.com, among others. Dye-Anderson also works to foster an atmosphere of inclusion. She helped establish the US group of the Black Professional Forum at Barclaycard, including hosting nine events in its first year. "Her creativity and collaborative approach to promoting our products and reaching company milestones is unlike any other," adds Maher. In just three years, Russ Dyer went from a communications director managing PR for one business unit at Kraft Foods to its VP of corporate affairs, overseeing all internal and external communications for an $18 billion food and beverage portfolio. His mandate includes management of Kraft’s corporate, brand, division and operations communications; creative services; and community involvement. Most recently he’s turned his attention to the merger between Kraft and Heinz – which created the fifth-largest food and drinks company in the world – managing all external and internal communications related to the deal, including the initial announcement, as well as follow-up media enquiries and preparation for SEC filings and disclosures. Even more impressive is the fact that Dyer didn’t get his PR start on the corporate or issues management side. Kraft hired him in 2012 out of the consumer practice of Weber Shandwick. "He not only believes that PR is a marketing discipline and not a stand-alone channel, but also brings the insight-driven thinking to ensure PR always ‘shows up well,’" says Jerry Gleason, Weber Shandwick EVP and Dyer’s manager for five years, noting that Dyer’s departure "left a major hole that we have struggled to fill." Tricia Ewald’s meteoric rise to an agency EVP is marked by award-winning work for top consumer brands and praise from clients, bosses, and direct reports alike. "Tricia’s leadership has been a critical part of building our business and growing our leaders from within the company," says Olson Engage president Bryan Specht. Ewald joined the Chicago-based Olson when it acquired scrappy boutique Dig Communications and along with it a Windy City prize: Wrigley. The account consisted of project work for just two brands when Dig tasked her with growing it as a recently joined SAE. She delivered. Wrigley named Olson as its AOR two years later, and the work has expanded to the confectioner’s entire brand portfolio, along with internal communications, corporate affairs, and crisis and issues. A savvy account leader known for her creativity, Ewald embraces the integrated mindset. Olson also tapped her to lead an advertising campaign for Whole Foods and a digital video effort for Sears, and last year put her in charge of account management across the agency as an SVP. She was promoted again this year. "She constantly challenges herself and our people," adds Specht. When it comes to global communications, Sarah Gavin certainly leads the way at online travel brand Expedia. As well as global PR, Gavin oversees corporate comms, brand-level PR, and social media. She worked her way up from director of PR and social media to senior director of integrated marketing, merchandizing, and communications to the lead comms role, advocating the advantages of a robust PR program at every step, so that today, comms staffers are brought in at the earliest planning phases for everything from acquisitions to product releases. Gavin built a social media program essentially from scratch, spanning community engagement, advertising, and influencer relations across the globe, and led the 2013 launch of the Expedia Viewfinder travel blog. She also gained international attention for the Expedia Find Yours campaign with a smart pairing to a timely topic, LGBT marriage. More recently, she has managed high-level corporate communications around the proposed acquisition of competitor Orbitz. 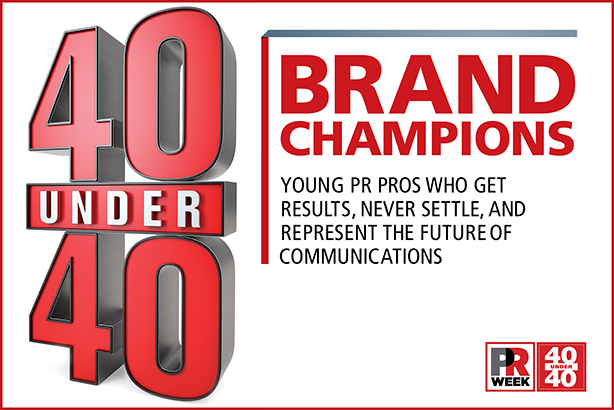 "Gavin has helped other PR professionals across the organization gain a stronger voice and identify a more clear advancement path," says one colleague. Thomas Gensemer champions integration like few others. In his first two years as chief strategy officer at Burson-Marsteller, he led a digital reorganization to ensure a truly integrated offering. He expanded the analytics practice and established a team dedicated to digital integration. His team recently opened Burson’s StudioB, a data-driven center of creativity, content production, and distribution. A colleague praises his "high-level command of technology" and strategic expertise: "He focuses on creating tools to enable people, as opposed to gadgets to amaze people." As a managing partner and CEO of Blue State Digital from 2005 to 2013, Gensemer is among those credited with building the groundbreaking operation that helped Barack Obama raise $500 million online in 2008 and mobilize millions of supporters with the Blue State Digital-built MyBo campaign site. Following the historical election, he went to work diversifying his firm’s expertise, acquiring clients such as Google and Vogue, and opened a London office. When WPP came knocking, Gensemer negotiated the firm’s acquisition by the holding company. At Burson, he was also appointed interim CEO of subsidiary Proof Integrated Communications. Credited as the "force behind" Porter Novelli’s fast-growing health and wellness practice, Paul George turned the division into a true global practice in just a few short years. He brought in significant new clients, including Teva, Merck-Serono, and Takeda, and grew work with existing clients, such as Pfizer and Bayer. Porter Novelli named him partner earlier this year, just one of 17 at the firm. "Paul brings boundless energy to his role, and his strategic counsel is highly sought after and respected by his clients," say colleagues. The global practice is so successful in part because of George’s knowledge, but also because his approach is one of empathy and respect. Examples of this include the Oncology on Canvas effort for Lilly Oncology that lets those with cancer and their caregivers express themselves through an art competition. A program developed for Bristol-Myers Squibb, SHE, provided a place for women and girls living with HIV to share experiences and information in a supportive environment. It was translated into eight languages and endorsed by community groups and the European Parliament. "Paul’s work has had true impact on healthcare companies and patients," explains another colleague. Serving as VP and director of corporate comms and corporate issues at Weber Shandwick, Michael Gonda so impressed Chobani over the course of his first year working on the account that the Greek yogurt brand decided to offer him its top PR slot. Gonda was presented with the task of reorganizing and rebuilding the fast-growth company’s communications operation. Working with CMO Peter McGuinness, Gonda dismantled traditional PR silos to let the discipline play a central role in problem solving and strategy development. The result has been a more customer-centric and results-driven approach. "We’re lucky we got him," explains McGuinness. "He’s been a key player in the stewardship of our brand, integrating external and internal communications, and providing insight and counsel for successful product launches." Although he started his career in journalism, writing for The New York Observer, among other publications, Gonda actively works to make PR a more desirable career option for those who might not consider it, including counseling graduates from his alma mater, Brown University, about PR. "His ability to relate to everyone is a quality that helps him stand out and excel in PR," adds McGuinness. Nurha Hindi heads up Hill+Knowlton Strategies’ West Coast health practice, where her new-business acumen led to consistent annual account growth of 50%. As the third staff hire for H+K’s Los Angeles office in 2007, she set out to establish and diversify its Western health portfolio, moving it from nearly 100% biotech to representing the full healthcare spectrum. Hindi plays a lead role for marquee healthcare clients including Amgen, Roche Diagnostics, UCLA Health, InnovAge, and Alcon. Her healthcare expertise combined with a "deep understanding of cultural and gender nuances" ensures her counsel resonates with client and consumer alike, says Monica Bouldin, GM of Southern California for H+K, who also worked with Hindi at Ruder Finn. "I have worked with Nurha since she began her career as a junior staffer," adds Bouldin. "From the beginning, she was driven, motivated, and passionate. She earned my trust quickly." Prior to H+K, Nurha worked at Amgen in its product comms department, where she served as a company spokesperson, excelled at building trust with internal colleagues, and helped launch a number of blockbuster products, including Enbrel for psoriasis. Under Leslie Holland’s careful stewardship, the American Heart Association and its Go Red for Women campaign to combat heart disease has broken into the national conversation. For eight years, she has led the organization and the award-winning campaign’s national PR strategy and activities, including all activations and media relations. She also manages the relationship with several stakeholders, such as its PR agency, Edelman; Macy’s, which is the single largest sponsor of the organization; and dozens of other Go Red sponsors. "Her insights are constantly sought by leadership in and outside of the association," says Catherine Helean, VP of comms at the American Heart Association/American Stroke Association. In the last two years, Holland has overseen new high-profile and global events for Go Red, including a tie-in with New York Fashion Week where celebs walked the runway in the signature Go Red for Women Red Dress Collection. Holland doesn’t just work for the association as she truly believes in educating women about heart health. She often takes time to connect the nonprofit’s real women ambassadors as they share stories on social media platforms and elsewhere. In eight years with AstraZeneca, Donna Huang has proven herself a skilled leader, a disciplined communicator, and the person everyone wants on their team, whether responding to a crisis or launching a product. "Donna is truly the best communications lead of the many I’ve worked with," says Paul Spittle, VP of cardiovascular and respiratory. "She also delivers outside of her role, as a key member of my leadership team." As a leader in the company’s corporate affairs division, Huang expertly maps out strategy to advance the group’s portfolio, including brand communications, government affairs and policy, and advocacy and alliance work. She has also worked in AstraZeneca’s US marketing organization and as the global brand communications senior director and global communications lead for the antiplatelet medication Brilinta. AstraZeneca recognized her smooth handling of a global crisis during a "highly visible inquiry into a company product" with both a US and Global Corporate Affairs Award and a CEO Award. Her mantel may be getting crowded. She won more than 10 PR industry and communications honors in 2009 alone for a groundbreaking atherosclerosis disease education program. As you might expect of the man leading comms for a mud-drenched obstacle course, Ben Johnson isn’t scared of a big challenge. He joined the organization two years ago as it began a rapid expansion into new markets – domestically and internationally – and saw the spotlight focused on it as extreme sports grew in popularity. Tough Mudder’s brand awareness has leaped more than 17% since he joined the Brooklyn, New York-based company. Its total number of participants jumped from 750,000 to nearly 2 million and it added three new types of event. It is set to host 60 events around the globe this year. "Ben leads a small, but nimble PR team, directing strategy in an efficient and thoughtful way. He understands the various elements involved in creating and executing effective PR campaigns," says Carol Gottshall, media relations manager at Tough Mudder, crediting his "proactive approach to both the company and the PR industry" for the organization’s successful track record. Although Johnson’s career kicked off in government as a comms assistant in the Denver mayor’s office, he went on to spend the next five years on the agency side, putting in time at Ruder Finn, Edelman, and Weber Shandwick. Known by colleagues as a game changer with big ideas, Marc Johnson joined APCO in 2008 when digital was a nascent, but growing focus for the industry, with social emerging as a crucial channel for corporate communications. navigate new territory. He took on the role of business development lead for APCO’s StudioOnline division, driving integration of digital and creative offerings leading to new scopes of work and millions of dollars in revenue. His ability to educate and build trust led to multiyear engagements with brands such as MasterCard, Ikea, and Red Bull. He worked closely with the former to launch its digital intelligence data center and develop a communications strategy for social media. "Marc’s keen sense of how digital has impacted the art and science of PR made him invaluable to my team," says Andrew Bowins, former SVP, corporate reputation and engagement for MasterCard, who recently joined Samsung Electronics America to lead corporate comms. With diplomacy another strength, Johnson trained a foreign government, including hundreds of employees, in digital, reshaping its communications. Ben LaBolt rocketed to national attention in 2008 as the young deputy press secretary for an ambitious presidential campaign for a relatively unknown Illinois senator: Barack Obama. LaBolt wasn’t yet 30 at the time he found himself in the middle of a historical election and a campaign that the PR industry continues to hold up as a case study in effective marketing, from its early social media prowess to its use of data and grassroots organizing. Suitably impressed, the Obama administration added him to the fledgling president’s White House as an assistant press secretary and spokesman for the White House Counsel. LaBolt became the 2012 Obama campaign’s national press secretary, building the comms team from the ground up, and serving as the on-camera spokesperson for the president’s successful re-election bid. Now he has set up shop as a founding partner of The Incite Agency, turning his campaign know-how into a strategic communications consultancy. He’s advising CEOs and Fortune 500 companies such as Google and Eli Lilly & Co., and startups including Crowdpac. Within just two years, he grew Incite to a staff of 10 with revenue exceeding $3 million. "With a laser-sharp focus and quick wit, he’s translated a political career into a corporate one," observes one colleague. Monte Lutz is a PR rockstar with strategies that are fully loaded. He leads the global, integrated comms team for some of the most popular video games on the planet, including Call of Duty and Guitar Hero. Since joining the video game publisher two years ago, he has built a more robust integrated communications strategy, spearheading important influencer and content marketing programs, including partnerships with 200 YouTube stars and 400 celebrities and athletes, and launched the Activision Games Blog and the company’s Twitter presence. Lutz has doubled media coverage and driven hundreds of millions of unpaid video views. A teaser campaign introducing Kevin Spacey as Call of Duty’s new villain drove 300 million impressions. Prior to Activision, he led social media at Edelman, where Lutz quadrupled the size of its Los Angeles team, launched the Seattle digital team, and established the firm’s social strategy group. "Monte is advocating for a point of view in which PR is not just a media hub, but also a content and influencer hub, in which communications drives discovery and empowers fans to help tell a brand’s story," says Michele Wyman, VP at PMK-BNC, Activision’s consumer PR agency in North America. Seth Martin, who leads all financial communications for GE, makes translating complicated financial transactions into relatable and compelling stories appear effortless. He connects with his audience without condescending or pandering, gaining the respect of colleagues and journalists alike. "Seth is a highly valued member of the communications team. He is strategic, focused, and a relentless storyteller for GE," says Deirdre Latour, GE’s CCO. "He is also a strong advocate for the journalist community – a rare combination in a corporate PR executive." Coordinating the comms strategy among GE’s eight multibillion-dollar businesses, Martin also manages media for all financial events and oversees digital, social, and measurement initiatives for the corporate team. His smooth handling of high-stakes transactions – the sale of NBC Universal and sell off of most of GE Capital assets – has earned him the trust of those in the C-suite as he serves as a senior comms adviser to the CEO, CFO, and head of investor relations. Prior to joining GE, Martin spent five years with Barclays, leading comms for all research and commodities business globally. He also handled media communications for the 2008 Lehman Brothers acquisition that transformed the bank’s investment operation during the volatile period. If you could measure the impact someone makes at a company, then Andrew McCaskill’s ratings would be through the roof. As the leader of Nielsen’s global media relations center, McCaskill oversees communications teams in more than 100 countries. Reporting to CCO Laura Nelson, his media relations strategy extends to multicultural communications, CSR, the IR team, and the company’s technology incubators in New York and Israel. "Andrew is smart, creative, innovative, an influencer, and the future of the business," says Kim Hunter, president and CEO of Lagrant Communications, and a mentor of McCaskill. The PR pro’s communications career first took off on the agency side of things. After stints at Coca-Cola and Turner Broadcasting, McCaskill joined William Mills and Associates, staying for more than a decade. As an SVP at Weber Shandwick, he led global communications strategy for the likes of ExxonMobil and Getty Images, before joining Nielsen last year. A past president of the Black Public Relations Society of Atlanta, McCaskill is a champion of corporate diversity and often takes the time to mentor other black men, as well as demonstrate to leadership how diversity impacts the bottom line. From Gap to Yahoo to Levi Strauss & Co., Amber McCasland has held leadership positions at several top consumer brands. As a senior director in corporate affairs for Levi Strauss, she manages external storytelling for the 162-year-old company, including strategic media outreach, community affairs, crisis communications, and content strategy. She has doubled the brand’s audience reach in each of the two years she has held her current role. Her efforts in highlighting Levi’s turnaround resulted in its first feature story in Fortune in a decade, as well as a front-page Financial Times piece. CEO Charles Bergh trusts her so much, he selected her to step in as interim CCO for eight months at a crucial point in Levi’s history. It was a smart choice. She oversaw a team of 30 while managing sensitive events such as the Bangladesh factory collapse that put the spotlight on overseas manufacturers, as well as successes such as winning the naming rights to the San Francisco 49ers’ new stadium. "Her ability to tackle key business objectives head-on, motivate her team to produce top-tier results, and commitment to her work is unique," says a colleague at Levi Strauss. a young analyst at 360i. Before turning 30, he had reached senior management status, leading large teams of 60-plus people, all while innovating in one of the industry’s hottest areas: measurement. At digital shop Mr. Youth, now known as MRY, he grew a small Olympics assignment into its largest client, with 3,500% revenue growth in two years. In his present role at MSL, which he joined last year, Melton leads global expansion and integration of digital technology, including further development of proprietary tools and creating new business opportunities. He helped launch the firm’s employee impact influencer offering. His reputation in the industry is such that he is a regular speaker at numerous conferences, including the Social Media Insider Summit and Social Media Week. "Leadership radiates from this guy’s pores," says Stephanie Agresta, who worked with Melton while serving as global director of social media and digital at MSLGroup, which she departed in June. "When Jeff is on the team, he increases its chances of winning." Fortune’s Most Admired Companies list for three years straight. "Linda is a motivational leader, skilled at charting a path-breaking course and inspiring her team and others inside and outside the organization to join her on the journey," says Jim Olson, VP of global corporate communications, who has known Mills for more than 10 years. Since joining Starbucks in January 2012 from Waggener Edstrom Communications, she has held leadership roles on both the consumer and corporate comms teams. Highlights include leading three holiday campaigns and introducing a number of new products, including Refreshers, Fizzio beverages, and Teavana Oprah Chai, which has donated more than $5 million to education. Colleagues commend her most for the strategic work showcasing Starbucks’ investment in its more than 300,000 employees, with programs such as its college achievement plan, which offers college tuition to workers, and a far-reaching program to hire low-income youth during a period of high unemployment for young workers. Unilever’s Heather Mitchell is rewriting the rules for beauty by bridging the power of communications and social media, while taking many of Unilever’s top brands global. As a director of PR and social media, she leads multifaceted campaigns for top brands such as Tresemmé, Dove Hair, Nexxus, and Suave, boosting awareness and brand prestige, but also driving sales. She was instrumental in Unilever’s most successful content marketing program yet: All Things Hair, a YouTube channel with top online beauty talent presenting tutorials and styling tips, often with a Unilever product. It has amassed more than 600 videos and more than 70 million views. "When we decided we needed to create a global position to look after our haircare brands’ PR and social media strategies, I knew Heather was the only person to do it," says Rishabh Gandhi, senior global marketing director, Tresemmé and new platforms. Mitchell’s leadership produced Unilever’s first social media community management strategies for Axe in 2008; launched Tresemmé into 40-plus global markets through New York Fashion Week; brought Toni&Guy salon haircare into more than 30 markets through London Fashion Week; and made Dove’s Love Your Curls a viral video. Gavin Portnoy’s main role is to use his PR skills to help find missing children. As the executive director of digital media at the National Center for Missing & Exploited Children, Portnoy is charged with developing smart digital comms tactics to reach the public. Portnoy only recently joined the center after a decade as a producer, writer, and editor in the film and television industries. Clients included Discovery Communications, the History Channel, Lifetime, and PBS. He has put his years of storytelling and production skills to work to create a new standard in the child-finding field. Portnoy created a digital media poster distribution method that gained 100 times more engagement than traditional posters and implemented a geo-targeting system to ensure posters appear in the regions where children went missing or are suspected to be located. In one month, it brought home six kids. He worked not only to grow the organization’s Facebook page audience, but also to diversify it. In just four months’ time, he grew the total reach to more than 3.5 million users from a base of about 200,000. "He is an innovator in the best kind of way," concludes a colleague. "Gavin has found a way to utilize his unique talents to make our country safer." Two-year-old, Brooklyn-based Praytell Strategy enjoyed 217% year-on-year growth in 2014, grossing $3.25 million. This year, revenue is expected to reach $4.5 million. Staff size has risen in turn, from two in 2013 to two dozen today. Much of this is owed to its founder: Andrew Pray. "Andy’s vision for the communications industry is truly inspiring," says Beth Cleveland, managing partner at the agency. "From his creative energy to his infectious enthusiasm that could rally a snail, Andy is building a better place to work for the next generation of communicators." With unconventional offerings such as the firm’s free Open Source Ideas site and the Passion Project – a grant program that offers free services to nonprofits – his firm has attracted an impressive client list that includes Hyatt, Logitech, the Mac AIDS Fund, Corona, and SoundCloud. Honors such as being named PRWeek’s 2015 Boutique Agency of the Year, as well as one of its Best Places To Work in 2014, validates that statement. Newsweek and Fast Company also highlighted the firm as an example of a positive, creative workplace. Perhaps the most important indicator, though: Praytell’s zero employee turnover rate. One of the youngest senior-level women in technology at FleishmanHillard, Erin Roche has consistently delivered double-digit revenue growth while managing the firm’s tech practice – its largest in terms of revenue – over the last two years. She played a key role in winning and managing the firm’s largest tech accounts, Samsung and SAP, and her teams have produced some of Fleishman’s most celebrated work for numerous clients. In the male-dominated technology industry, Roche actively works to close the gender gap and support the next generation. She serves on the advisory board for Girls Who Code. Her efforts helped secure a $1 million donation from AT&T at the nonprofit’s 2014 gala. She also hosts a monthly Women in Technology networking group. "Erin is a tireless champion of women in our business and the technology industry," says Robert Dowling, former president of Fleishman’s US East region and GM of New York. Prior to joining Fleishman, Roche spent more than a decade with Weber Shandwick. In three years, she helped build its tech practice from $2 million to $15 million, while counseling top clients such as Motorola, Juniper Networks, and HP. In two short years with Wells Fargo, Trisha Schultz is credited with producing outstanding results. Working first as a consultant and now as a VP in corporate communications, Schultz turned the traditionally press-shy capital finance division into a media standout, taking it from virtually no media coverage in 2012 to more than 3,400 placements in 2014. She did so by relentlessly, but carefully persuading management on the value of PR and forging strong media relationships. So much so that leadership now insists on her presence at their quarterly management meetings. "Trisha is recognized by her managers as an outstanding leader, innovative thinker, and tireless champion of the Wells Fargo brand," says Oscar Suris, EVP and head of corporate communications at Wells Fargo. An experienced storyteller, Schultz played a defining role in creating the company’s new One Wells Fargo approach, which brings together traditionally siloed businesses by identifying synergies and promoting them in a holistic manner to tell a single inclusive story. "This practice has enabled the brand to facilitate storytelling in cities that don’t have a retail bank branch and trade industries that are untapped," adds Suris. Jaime Schwartz, a registered dietitian, translates the science behind nutrition into communications and business opportunities for clients such as Nestlé, Wendy’s, and Frito-Lay. Schwartz serves on Ketchum’s food e-commerce and food b-to-b task forces, leads the firm’s global nutrition task force, and manages a team of four dietitians. Her expertise has brought on new clients such as Zespri Kiwifruit North America and contributed to growth for existing clients such as 7-Eleven. Schwartz also laid the groundwork to help Ketchum client Avocados from Mexico burst into the mainstream as a first-time Super Bowl advertiser in 2015. She spearheaded the development of a health influencer strategy that enables brands to elevate their reputation by strengthening relationships within the health, medical, and nutrition communities through Ketchum’s health influencer network. The most sought-after part of this offering is the supermarket RD network, which connects clients to more than 600 registered dietitians working in or with US supermarkets. "She’s a pioneer in breaking down barriers between brands and gatekeepers of public opinion about food and nutrition," says Lauren Mundell, SVP and director of Ketchum’s New York food and wellness practice. Margaret Shepard leads the six-person strategic comms team for the US Chamber of Commerce, an organization representing more than 3 million businesses. Shepard’s group works to deliver the voice of business and a message of free enterprise to the US government and public, and around the globe. A savvy content marketer, Shepard leads programming for the Campaign for Free Enterprise, a key chamber effort. In her first year as the managing editor for FreeEnterprise.com, the site racked up more than 2 million unique visits, making it the group’s most-visited digital property. Some of the site’s unique content has been picked up by outlets such as Time and Fast Company. "Margaret is a creative, thoughtful, and proactive leader," says Tom Collamore, the chamber’s SVP of comms and strategy. "It is easy to see her brilliant ideas at work in some of the chamber’s flagship campaigns." For the chamber’s This Way to Jobs campaign, she took a complicated subject – the legal and regulatory hurdles to job creation – and turned it into a clever board game. Shepard also created one of the first YouTube video contests hosted by an association and later kicked off a cross-country blogger tour, On the Road with Free Enterprise. When last year’s Vocus-Cision merger generated headlines across international media, Breeanna Straessle was at the center of the media storm. And then as the company went on an acquisition spree, snapping up Gorkana, Visible Technologies, and Viralheat, she was in the spotlight again. As corporate comms director for Cision, Straessle oversees a team of seven PR, design, social media, and copywriting professionals. Along with executing media strategy, she leads influencer and analyst relations, social media and content marketing, and much of the brand and creative work, including native advertising. Before the merger, Straessle led Vocus’ communications and social media teams. She increased media coverage of its annual conference by 623% and social media buzz by 157%. "Breeanna is strategic, thoughtful, a team player, and a leader," notes a colleague. "She’s described by department heads as an incredibly hard worker, with an absolute dedication to the team and its success." to marketing director, leading digital strategy for a variety of clients. When it comes to the public affairs sphere, Doug Thornell knows the Beltway like few others. His prior comms work for a number of top Democrats and causes – former Gov. Howard Dean, two years as national press secretary for the Democratic Congressional Campaign Committee, and a post as a senior adviser to Rep. Chris Van Hollen (D-MD) in the early years of the Obama White House – serves him well as an MD now charged with building out the firm’s public affairs practice. "Doug has taken every experience from the campaign trail and Congress and converted that into strong, actionable counsel for his clients," says Kelley McCormick, fellow MD at the firm. In four years, he’s worked on some of SKDKnickerbocker’s biggest accounts: political campaigns and leading energy and tech companies. Thornell is one of the agency’s media trainers, working with CEOs, candidates, and nonprofit executives to hone their press appearances. He recently launched SKD’s Beyond the Beltway Insights initiative, a joint public polling project with Benenson Strategy Group. His promotion last year made him the firm’s youngest MD. He is a regular on the cable news circuit and among a group of political thought leaders who give their views on hot-button issues for the National Journal. When it comes to building integrated campaigns, Maryann Watson always thinks big. She oversees a global network of 85 creative strategists as the president of Ruder Finn’s digital practice, RFI Studios, spearheading high-impact work for clients including McDonald’s, Samsung, Nokia, MetLife, and Pfizer. Her work on McDonald’s includes its global brand initiative, imlovinit24: a series of 24 public events in 24 cities in 24 hours. This marked the first time McDonald’s connected its regional marketing, digital, and PR teams to align in a large-scale corporate-led campaign. She also supports the company’s chief digital officer with thought leadership, influencer outreach, and partnership strategy. Watson’s influence is felt throughout Ruder Finn as she champions the use of advanced technologies, including reactive screens and new social analytics applications. She formalized RFI Labs, which focuses on tech immersion and allows the company to experiment on new platforms beyond client work. "Maryann has always demonstrated exceptional leadership, strategic insights, and out-of-the-box thinking that helps keep the agency at the forefront of the industry," notes Kathy Bloomgarden, CEO of the agency. "People like Maryann are the future of PR." Max Wild’s creative mastery and passion for finding innovative solutions rack up new business wins and impress even the toughest of clients. "Golin employs more than 1,000 staffers around the world and no one comes close to Max in being able to quickly develop ideas under pressure," says Matt Neale, Golin’s international president and co-president of its New York office. "Give the man a seemingly impossible challenge, five minutes, and a locked room, and he will come out with 10 ideas, with at least three that will be client-ready." Wild is the creative lead on more than 50% of new business opportunities for Golin New York. His client roster has included Crayola, Stoli, Nintendo, Canon, Unilever, Cadbury, Glenfiddich Whisky, Oracle, EMC, and Expedia. He was part of the team that drove the rebrand from GolinHarris to Golin and the new agency credo to "Go All In." Known by colleagues as "incredibly passionate about coming up with ideas that make a difference," he’s a cofounder of Bright Collective, Golin’s co-creation portal that draws on diverse creative minds from a range of industries to think up big ideas, such as an antiviolence event for the Chicago Children’s Choir.